Last night, out of the blue, The Seven-Year-Old pulled this picture book off the shelf and asked if she could read it to me. Listening to my daughter read the story and seeing the joy she took from it, I was reminded about what a very good book it was. If you’re looking for a picture book about friendship springing up in the most unlikely of places for a little one in your life, I encourage you to give this book a try. Also, I need to get back to doing book reviews. Maybe in the new year. Anyone got books they want me to review? Put your requests in the comments field or email me at shalahowell (at) gmail.com and The Seven-Year-Old and I will get reading. 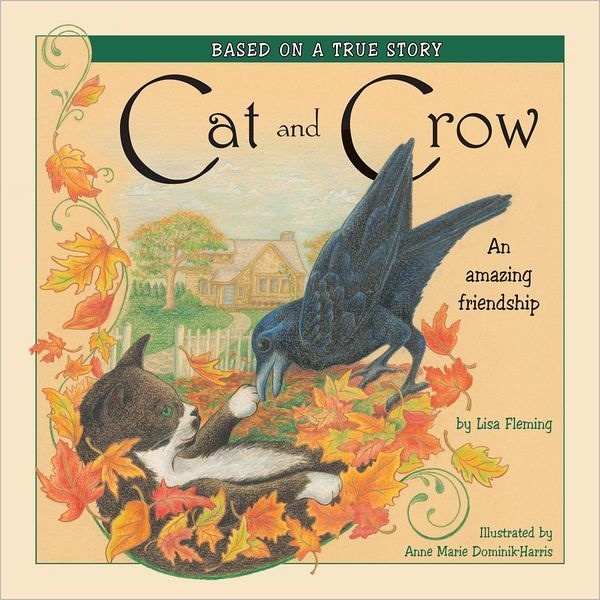 Did you see the YouTube video about the cat and the crow who became best friends? The interview on Oprah? The National Geographic, Animal Planet, or Miracle Pets specials? Yeah. Me neither. At least, not until I’d found this book in our local bookstore and decided to hunt the videos down on the Intertubes. For those of you who haven’t heard the story before, a few years ago a crow named Moses adopted a motherless stray kitten (Cassie) and raised her as his own. Moses fed Cassie, wrestled with her, even shooed her out of the street when cars were coming. The unlikely friendship lasted for four years, until Moses the crow finally disappeared. Cat and Crow tells the story of the surprising bond between Moses and Cassie, from the perspective of Wally and Ann Collito, the couple who eventually gave Cassie a permanent home in North Attleboro, Massachusetts. Although the writing is a bit choppy for my taste, I still like this book. It’s a sweet story, sweetly illustrated by Anne Marie Dominik-Harris. Mostly, I like this book because the story played out just a few towns over from Caterpickles Central, and keeping an eye out for Moses and Cassie makes our visits to Capron Park just that much more interesting. The story is also a great opening to talk with my Caterpickle about friendship, and finding friends in the most unlikely places.